I've been admiring those beautiful deco mesh wreaths since etsy became popular, but they are expensive! I'm pretty positive I've never seen one priced below the $75 mark. When I noticed that tutorials were starting to pop up all over Pinterest, I finally decided I would give the do-it-yourself version a try. And it worked!! 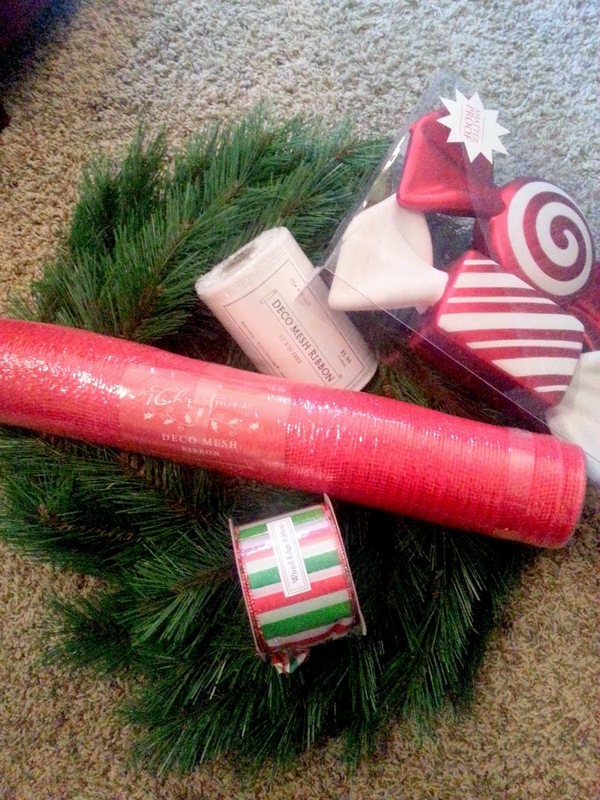 There are a million and one tutorials out there for DIY Christmas wreaths! I read through a bunch, not really finding exactly what I was looking for and then I discovered this video. The tutorial uses different materials than I ended up purchasing, but I do like how they demonstrate the overall idea. I found the wreath half off at JoAnn Fabrics and everything else was half off at Hobby Lobby. Overall, I spent $30 on what would have cost me more than double to purchase! To get started, fluff out some of the branches on the wreath so they can be easily twisted. Begin by securing the start of the 21" deco mesh with a wired branch. Usually the wreaths have an outer and inner area; I did this part on the outer wreath section. Every six inches or so, gather the deco mesh and twist a branch over it to secure to the actual wreath itself. Make sure to gather and fold the mesh as you go to achieve the look you want. Once you have done this around the outer wreath, you can move on to the 5 1/2" deco mesh ribbon. Secure this one using a branch on the inner wreath. Weave in and out through your outside deco mesh, securing the ribbon with a branch every so often. 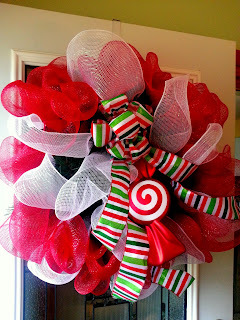 Once this is complete, you can make a bow with the wired ribbon and again, use a branch to hold it to the wreath. I used this visual aide to guide me through making a bow. 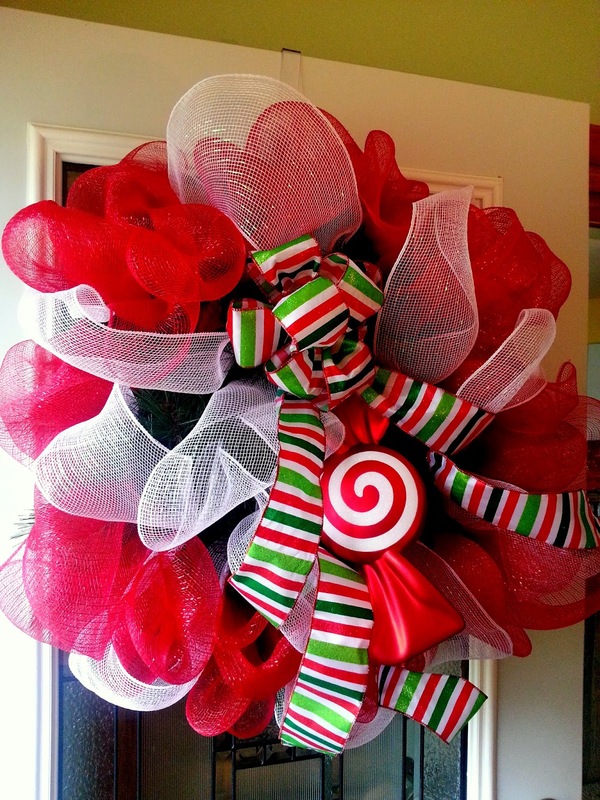 Finally, I secured my candy to the wreath, fluffed everything a final time and hung on the door! Hi there! I currently live in Indiana with my two dogs while my husband is stationed in North Carolina. We're in the process of making the big transition back into city life. Through several of my hubby's deployments, baking has become a real hobby of mine so this blog is to document all the recipes I use & to share my baking adventures while here, there, and everywhere in between. Here we come, Chicago!